It would really be nice if gmail, docs, and reader aligned with one another. I would love to be able to move a message/feed into a label and have that shared with others the same as is in docs. @jack where did you see that "uploading of jpgs is supported"? I couldn't find JPG in the supported formats. You have always been able to upload images (jpg, png, bmp), but they're added to a new document. On an unrelated note, Blogger should do something so that I do not receive notification for the comments I make. Who needs to be notified of their own comments anyway? How did you get the Google Chrome folder. Whats that for? Bookmarks? Yeah...I noticed the Chrome folder too. I think it's for Bookmark syncing. Excellent. With this, Google apps is now pretty much better than Blackboard. 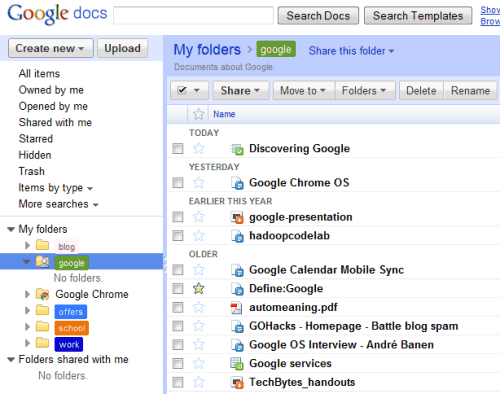 Google drive exists ; it's Google Docs + share option. 1/ Google docs is unlimited in file number. 2/ An example : I'm a blogger and prepare quite all my stuff with Google docs. This morning I found a nice prsentation. I save it to Google Docs, I edited it, I add the "share to everyone" option, got the link, shortened it with tinyurl and publish it on my blog, and that's it. More : if I want to modify this file I just have to change it on "my" computer and it will be changed, without any effort, on "my" blog ! Of course you can apply that to every type of document in Google Docs. This share innovation in Google Docs is, at least, as important for a blogger as the embed code option with videos. nice new feature. somehow though, the interface looks like it took a quality hit. looks like something old google made in many respects. liked the old google docs look and colors. Google Chrome 4.0.221.6 supports bookmarks sync with Google Docs!! That's very nice, I'm just wandering what will happen to www.google.com/bookmarks that I've been using for a lot of time. Now Google has two bookmark services and this is a bit weird. I like the new Interface. Simple and fast, this is Google. 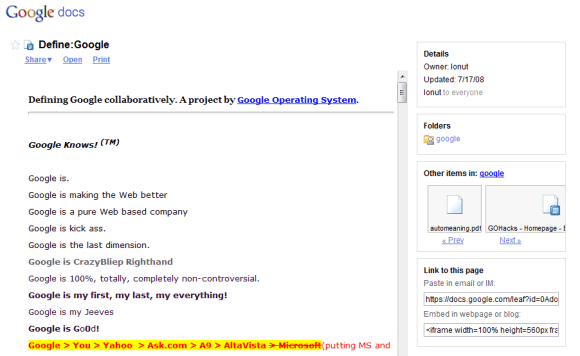 Am i the only one to notice the "google OS interview" file in the corresponding persons filebox? what happened to the flash uploader? it's not here at the moment. The flash uploader is back now!